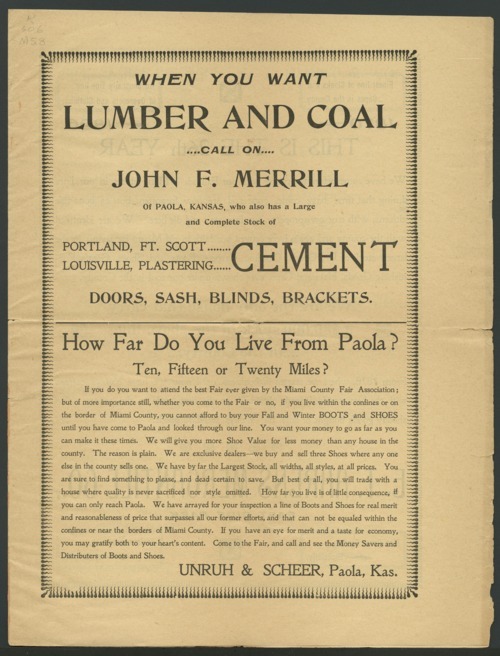 This pamphlet is an advertisement for a number of Paola businesses to encourage patronage of their companies by people attending the Miami County fair. Some of them include John F. Merrill, Unruh and Scheer, E.T. Ahrens Mercantile Co., Stem and Robinson, George L. Robinson, S.J. Hurst and Co., G.H. Hall, Voglesong and Poteet, S.D. Condon, and Peiker and Wishropp.